Know Your Needles: Needle Basics » Embroidery Talk Has Moved! Those of you who have been reading this blog for a while know that I’ve done blog posts about needles in the past. It has been a while, however, since I covered the topic, and I thought today would be a good time to go over some of the basics facts about machine embroidery needles. I know new people are coming into the business all the time, and this information may be helpful to them, or to established business owners, simply as a refresher course. First, I wanted to discuss something that I didn’t know, just because I think it’s a neat piece of information. I’ve wondered, for a while now, why needles are numbered the way that they are. As it turns out, the needle numbers are a combination of the American and European needle numbering systems. The American system numbers needles from 8 to 19. The European system numbers needles from 60 to 120. The smallest numbers are the lightest needles, the largest numbers are the heaviest. So, for instance, a 65/9 needle would be lighter than an 80/12. Apparently how the numbers are listed is a matter of preference. Second let’s talk about the needle shank. There are two types of needle shanks, flat and round. As a general rule, flat shank needles are used in home sewing machines and round shank needles are used in commercial embroidery machines. 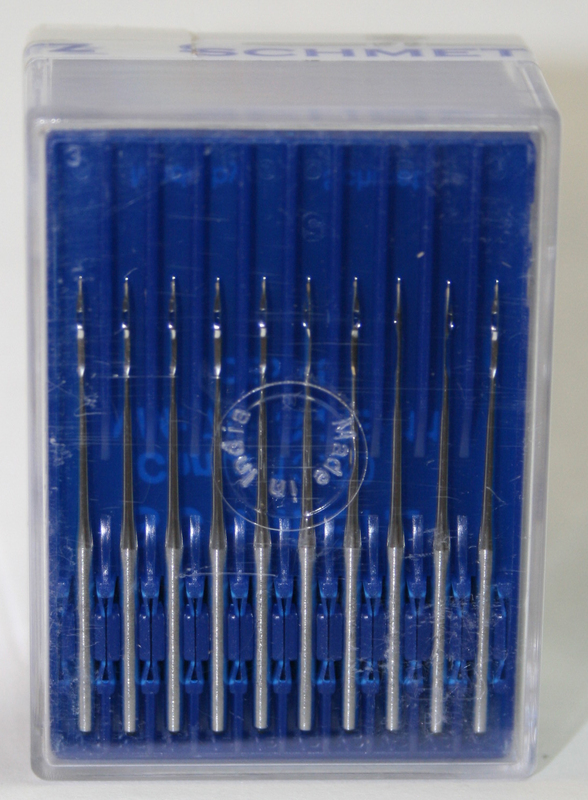 Round shank needles generally have a larger eye which allows machine embroidery thread to pass through the needle more easily. In either case, whether your needle shank is round or flat, the shank is the thickest part of the needle and fits into the needle clamp. Third, we should probably examine the difference between ball point and sharp point needles. 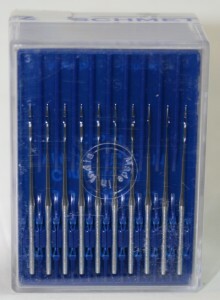 Sharp point needles are exactly what the name implies, needles with a sharp point. The needles create more a cutting action when they are used to embroider fabric. The sharper tip makes it easier for the needle to penetrate densely woven fabrics. By contrast, a ball point needle has a rounded tip. The rounded tip of the needle offers less of a cutting action which makes these needles ideal for loosely woven fabrics or knits. Finally, we should discuss how often to change your needle. According to Schmetz Needles, the manufacturer that makes the needles that EnMart sells, a good rule of thumb is to change the needle every 8 hours or at the beginning of each project. Of course, how often you elect to change your needle will depend on the type of fabric you sew and your machine. As you get to knwo the machine better, you’ll be able to determine what schedule of needle changes is right for you. This entry was posted on Tuesday, August 10th, 2010 at 12:41 pm and is filed under Uncategorized. You can follow any responses to this entry through the RSS 2.0 feed. Both comments and pings are currently closed.